Your ability to drive safely is compromised whenever your suspension is out of whack and requires an Auto Suspension Repair by a reputable repair shop such as Lloyd’s Auto Clinic in Kent, Washington. One example of a suspension problem is when your wheels are out of alignment. This is a relatively simple Auto Suspension Repair. Sometimes unaligned wheels are obvious because your steering wheel has a vibration in it from balance problems or your vehicle will pull to one side of the road. However, there are times when the suspension problems are more subtle and the driver might not even notice. That is the reason that it is a must to have regular wheel alignment inspections. Your vehicle will continue to run more smoothly the more regular the maintenance, especially on the suspension system. If the wheel alignment on your vehicle doesn’t feel right, you should bring it to our ASE certified automotive technicians who are also experts and wheel alignments for a complete suspension inspection. Proper wheel alignment will provide optimal, longer lasting, and better handling of your vehicle. Our ASE certified automotive technicians know how to keep your vehicle running smooth and straight. These components do more than simply provide an enjoyable and comfortable ride. They also work in unison to help keep your vehicle securely and safely. A properly maintained suspension system will help keep you in control of your vehicle while that suspension system, including your coil linkage and springs, and struts or shock absorbers help to keep your tires in better contact with the road for better traction and help to support the weight of your vehicle. The alternative is sometimes an Auto Suspension Repair. Our ASE certified automotive technicians will ensure that your suspension is functioning properly. Whenever you are on the road, your suspension system helps you maintain control of your vehicle. We can help to make sure that you are driving safely by maintaining your suspension system. The suspension system on your vehicle serves two main purposes, which are managing road handling and road holding ability. Therefore, the suspension system on your vehicle also minimizes noise, vibrations, and bumps and maximizing passenger and driver comfort while managing the safety of your vehicle as it maneuvers on the road. 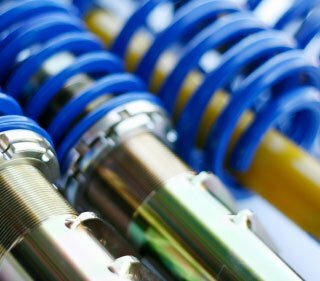 Struts and shocks are integral components of the suspension system on your vehicle and the safety of your vehicle is significantly impacted by their wear. Worn auto suspension components such as struts and shocks can affect how the wheels on your vehicle make contact with the road, and can result in compromised road holding and handling, deteriorated performance, hydroplaning, and dangerous swaying. This is another reason for Auto Suspension Repair. Approximately 50,000 miles is the useful life of auto suspension components such as struts or shocks. During those miles, the auto suspension such as the struts and shocks on your vehicle will have cycled more than 85 million times, which can result in potential wear and tear of their internal auto suspension components. You should consider replacing these auto suspension components if the mileage on your vehicle exceeds that amount. This also requires an Auto Suspension Repair. Driver control can be reduced as well as vehicle safety and stability can result from worn auto suspension components. Indications of worn auto suspension components such as struts and shocks might include uneven tire wear, a crooked steering wheel, sliding, pulling, bouncing, the rear end of your vehicle buckling under acceleration, and the front end of your vehicle diving when under braking. This might also accelerate wear and tear on your tires as well as other auto suspension system components. It is also important to know that auto suspension components such as struts and shocks don’t always show visible signs of wearing or damage. Independent testing has demonstrated that you can improve the stopping distance of your vehicle by ten feet by replacing your struts and shocks by doing a suspension repair after 50,000 miles. We can provide strut and shock services to repair the suspension system on your vehicle that are specifically designed to restore the suspension system of your vehicle to the original specifications provided by the manufacturer. New struts and shocks is a suspension repair that will offer superior comfort, enhanced safety, shorter braking distances, improved handling, greater stability, and a better and more comfortable ride.